Do you need to find out if you have enough space for vehicles to turn? There is a pogram to draw any possible turning radius. If you are designing a parking garage and have very narrow turning spaces or if you are trying to fit a service dock in an area where you are not sure if the trucks will be able to manoeuvre a template showing the inner and outer turning radius might not be enough. 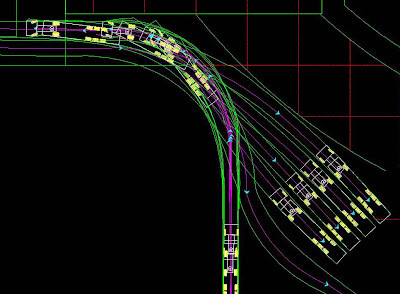 What you need is a program that can simulate the trajectories of Cars, Trucks, Buses, etc. And there is one. The awesome piece of software created by Transoft Solutions is called AutoTURN. It is a commercial product with a price that varies depending on the type of license (we inquired at work some months ago and the price given for our type of license was around $250), but if you are into any kind of Site Design, Road Design or anything involving vehicle movement it is worth the price in a single use. Let me show you a quick snapshot so you can get an idea. Recently we've been trying to figure out if we could fit a Service Dock for 4 SemiTrailers 16.50m long in a pretty tight piece of a project. With AutoTURN we managed to see that we did have enough space making some little adjustments on the project. You can download a Demo Version going to the AutoTURN Website to give it try with only one vehicle type (an articulated Bus).